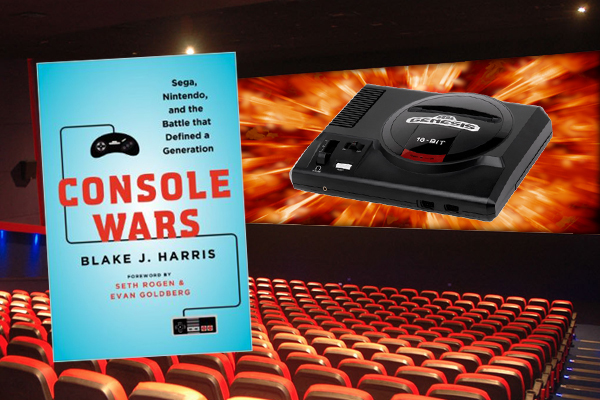 Back in early 2014 we shared the news that the Blake J. Harris book CONSOLE WARS: Sega, Nintendo and the Battle that Defined a Generation would be releasing as a documentary and then a movie, produced by Seth Rogen and Evan Goldberg. Since then, the book released and we not only reviewed it, but we also had the honor of interviewing former SEGA of America president Tom Kalinske, former director of marketing Al Nilsen and the book’s author Blake J. Harris. We also covered the Console Wars Comic Con panel, providing exclusive video of the event. Suffice to say, we loved Console Wars. Since then, however, Hollywood has been silent on the documentary and movie front… until now! Via Variety comes news that the book will no longer be adapted into a movie, but instead a limited series. Rogen and Goldberg will executive produce, and Jordan Vogt-Roberts (writer of Kong: Skull Island) will direct with Mike Rosolio set to write the pilot (the latter two will also serve as executive producers). We don’t know where the series will air yet, but recent Rogen and Goldberg projects premiered on Hulu and Amazon Prime. We open Read-Only Memory’s “Sega Mega Drive/Genesis: Collected Works” live with project lead Darren Wall and “Console Wars: Sega, Nintendo, and the Battle that Defined a Generation” author BLake J. Harris. The event starts at 6PM EST (11PM GMT) and an archived video will be posted shortly after the live feed ends. The archived video is embedded above! SEGA Mega Drive/Genesis fans listen up – we have something very special planned for tomorrow! 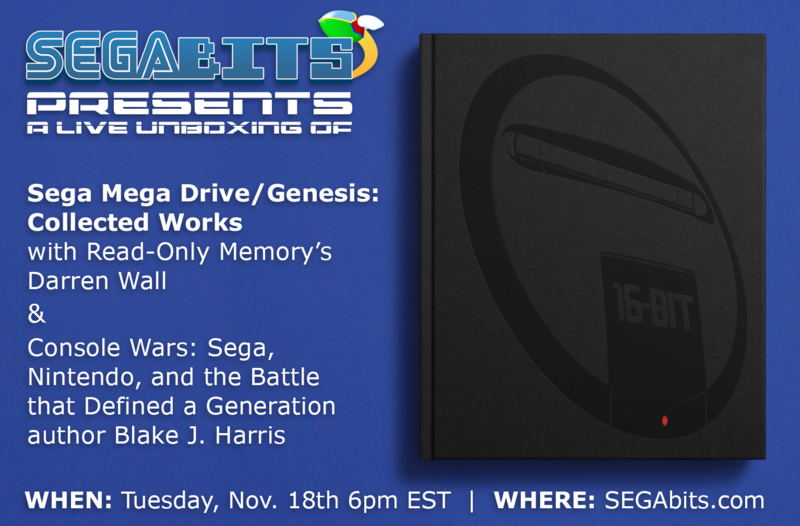 We will be unwrapping and paging through Read-Only Memory’s “Sega Mega Drive/Genesis: Collected Works” book live with project lead Darren Wall providing page-by-page commentary. 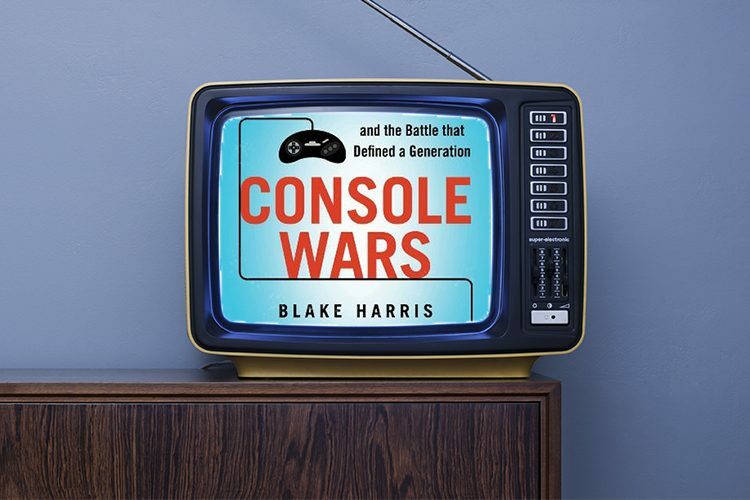 If that wasn’t enough, we will also joined by Blake J. Harris, author of the book “Console Wars: Sega, Nintendo, and the Battle that Defined a Generation” who is sure to have some stories of his own to share. The live stream will appear at SEGAbits.com tomorrow at 6PM EST, so keep your eyes open for a dedicated article with the embedded live stream video and keep up with us on Twitter and Facebook for updates. This past weekend, SEGAbits writers Ben, Shigs, and Nuckles hit San Diego Comic Con and SEGA’s game preview event located at the nearby Nerd HQ. While Comic Con isn’t as game centric as E3, there was quite a bit of SEGA goodness to be found. We were able to check out the latest preview builds of Alien: Isolation and Sonic Boom: Rise of Lyric, as well as interview Archie Comics on the upcoming Sonic Boom comic book series. But the main event had to have been Sunday’s Console Wars panel. The panel, which centered around the SEGA and Nintendo rivalry of the 90’s, featured special guests Tom Kalinske (Sega of America), Al Nilsen (Sega of America), Bill White (Nintendo of America), and Perrin Kaplan (Nintendo of America), as well as Console Wars author Blake J. Harris and Julian Rosenberg, producer of the upcoming Console Wars documentary. Thanks to Blake, Nuckles and Shigs were given the VIP treatment and secured some awesome seats – allowing us to film the panel and Q&A session and meet the SEGA and Nintendo legends! Check out the full panel above, and make sure to pick up your copy of Console Wars if you haven’t already! Want more Console Wars discussion? Check out our three part interview series with Tom Kalinske, Al Nilsen, and Blake J. Harris. The official site for the Console Wars book has officially announced that a Console Wars panel will be taking place at San Diego Comic Con featuring SEGA and Nintendo all-stars Tom Kalinske (Sega of America), Al Nilsen (Sega of America), Bill White (Nintendo of America), and Perrin Kaplan (Nintendo of America), as well as Julian Rosenberg, producer of the upcoming Console Wars documentary alongside Console Wars author Blake J. Harris. The panel will be in Room 23ABC at 2:30 p.m. on Sunday, July 27th and Blake will be signing copies of the book in the autographing area, table AA09, from 4 – 5 p.m.
And guess what? SEGAbits just might be attending, as we’ve obtained press passes for the convention! We’ll alert our readers on the social networks once we have our Comic Con plans finalized. This is it! Our third Console Wars focused episode of the Swingin’ Report Show in which we speak with the man himself, SEGA of America’s former President Tom Kalinske! Tom has an amazing history with the toy and game industry. Before his years with SEGA, Tom served as President and CEO of Mattel, reviving the Barbie brand and creating the He-Man and the Masters of the Universe line. During his time at SEGA, Tom reinvigorated the SEGA Genesis brand, helped in the creation of Sonic the Hedgehog, and led the launch of many famous pieces of SEGA hardware including the Game Gear, Pico, 32X, Nomad, and Saturn. Tom Kalinske’s career is chronicled in the book “Console Wars: Sega, Nintendo, and the Battle that Defined a Generation” by Blake J. Harris, and if you haven’t purchased a copy yet, do so today. If you’ve read the book, are reading the book, are awaiting delivery of the book, or are simply a fan of SEGA during the 90’s, our latest show is a must listen! Also, make sure to check out our other Console Wars interviews including our discussion of SEGA’s marketing efforts with SEGA’s former Director of Marketing Al Nilsen and our interview with the author of Console Wars, Blake J. Harris. Happy Console Wars release day! 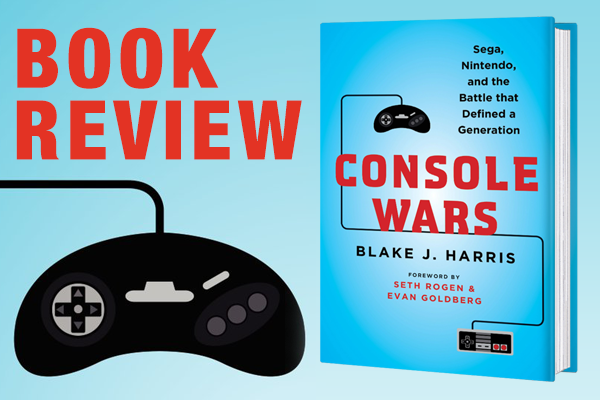 That’s right, the long talked about book “Console Wars: Sega, Nintendo, and the Battle that Defined a Generation” by Blake J. Harris is now available to purchase anywhere where books are sold. For this week’s podcast, the book’s author Blake J. Harris joined Barry and George to talk about his influences, the process of writing such an epic story, his upcoming documentary, and his teaming up with Scott Rudin and Seth Rogen. Blake also shares stories that didn’t make the final cut, and his thoughts on modern day SEGA and Nintendo. We also reveal our Console Wars giveaway winners, so if you entered on Twitter, Facebook, or Instagram to win a copy of the book courtesy of HarperCollins, give the show a listen and find out if you’ve won! We’ll also make an official winners announcement on our social networks later today. More “Console Wars” content is to come, including a podcast with Tom Kalinske himself! 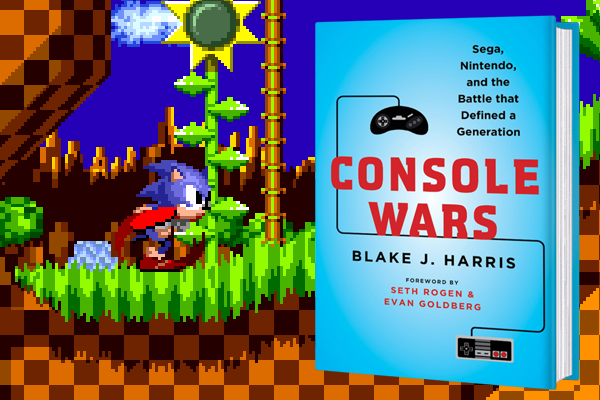 Thanks to It Books, HarperCollins Publishers, and author Blake J. Harris, we have an exclusive excerpt from “Console Wars: Sega, Nintendo, and the Battle that Defined a Generation” which features the first time SEGA of America President Tom Kalinske and his staff laid their eyes on Sonic the Hedgehog in action! The full excerpt can be found after the break, and if you like what you read, make sure to pre-order a copy of the book today and enter our Twitter and Facebook contests to win a copy of the book. Contest winners will be announced on our release day podcast with the book’s author Blake J. Harris, which will debut alongside the book tomorrow! The above sentence is found on the official website for the book “Console Wars: Sega, Nintendo, and the Battle that Defined a Generation” by Blake J. Harris, and having read through the book myself, it’s an accurate description. Upon reading “Console Wars”, I couldn’t help but feeling a bit bloodied and bruised, but proud to have chosen the side that I’m on as a fan. “Console Wars” is not a detached history lesson of the SEGA vs. Nintendo rivalry of the 90’s, it does not read as several wikipedia articles. Instead, “Console Wars” is a very real and personal story largely told from the perspective of SEGA of America President and CEO Tom Kalinske during the first 6 years of the 90’s. Taking the journey along with Tom, readers also occasionally go behind-the-scenes with Nintendo and Sony, and receive a few extended history lessons on the histories of companies like SEGA, Nintendo, Sony, and others. This mix provides the reader with both factual and emotional reasons for why SEGA and Nintendo did what they did, and as such is the most honest and truest account I have ever read of this period of video game history. The SEGAbits Swingin’ Report Show is back, and boy do we have a special episode for you! Joining us for our 60th episode is Al Nilsen, SEGA of America’s Director of Marketing from 1989 through 1993. Al and his team were behind everything from the early days of the SEGA Genesis, including promoting the famous “Genesis Does What Nintendon’t” campaign, the creation of Sonic the Hedgehog, implementing the legendary “Sonic 2sday” worldwide launch of Sonic the Hedgehog 2 in 1992, and rolling out the “Welcome to the Next Level” campaign. Suffice to say, Al is a legend, so the opportunity to sit down and talk about the good ol’ days for an hour and a half was a dream come true for us as SEGA fans. Al’s appearance is in anticipation of the release of “Console Wars: Sega, Nintendo, and the Battle that Defined a Generation” by author Blake J. Harris, which you can pre-order today from Amazon.com. “Console Wars” tells the story of SEGA vs. Nintendo during the early 90’s, as told from the perspective of SEGA of America president Tom Kalinske. 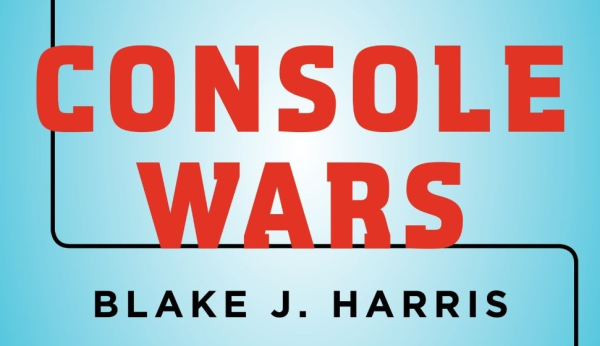 Based on over two hundred interviews with former SEGA and Nintendo employees, “Console Wars” is the underdog tale of how Kalinske miraculously turned an industry punchline into a market leader. It’s the story of how a humble family man, with an extraordinary imagination and a gift for turning problems into competitive advantages, inspired a team of underdogs to slay a giant and, as a result, birth a $60 billion dollar industry. Expect more “Console Wars” content throughout May, including a podcast with the author Blake J. Harris next week, and a podcast with Tom Kalinske himself the week after that! We also have some surprises, but in the meantime enjoy Al’s interview! To gamers, the battle of SEGA and Nintendo is something of legend. The video game giant Nintendo being taken on by the underdog SEGA. It’s almost like something out of a movie. So it only makes sense that the publishing industry and Hollywood would jump at the chance to make a book and film about the console wars. 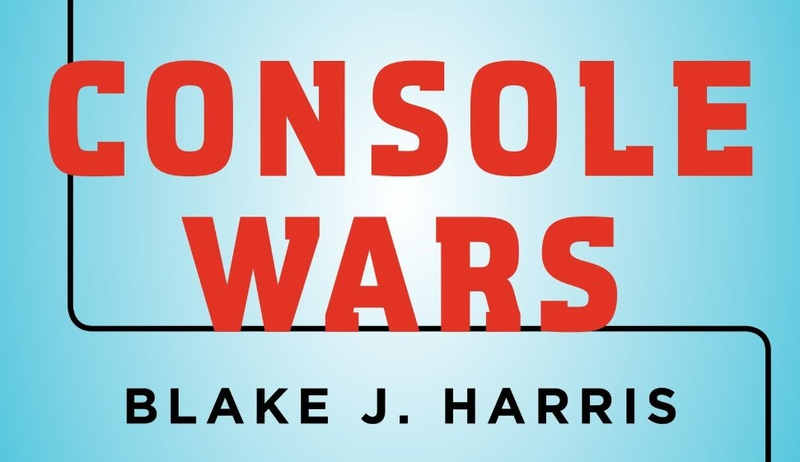 It was announced this week that Atlantic Books has acquired the UK rights to the book CONSOLE WARS, written by Blake Harris. The book is described as “a riveting behind-the-scenes business thriller that chronicles how SEGA, a small, scrappy gaming company led by an unlikely visionary, took on the juggernaut Nintendo and revolutionized the video game industry”. So basically The Social Network meets Rocky, and SEGA is the good guy. Atlantic plans to publish CONSOLE WARS: Sega, Nintendo and the Battle that Defined a Generation in August 2014, meanwhile American’s can expect the book to release this May from It Books. Sony Pictures and Scott Rudin, of Moneyball and The Social Network, are developing a film version of the book, which is to be written and directed by Seth Rogen and Evan Goldberg of Knocked Up and Superbad fame. The book’s writer Blake Harris is serving as Executive Producer and has his own version of the story, a documentary, in the works. The news of the film is nothing new, however this is the first time in a while that we’ve heard anything about it. Back in 2012, IGN came across Sony Pictures registering the domain for Console wars the Movie. So in a few years time we may very well see SEGA vs. Nintendo the Movie! Hey, if Facebook gets a movie, SEGA easily deserves one. Update: Interestingly, this isn’t the first mention of Rogan and Goldberg being attached to a film version of the book. Back in late 2012 their involvement was mentioned in a Facebook post made by Trident Media Group. Despite this, it appears that the news was never picked up and reported elsewhere. That same day, Rogan and Goldberg tweeted about it. Console wars, they never change. EA has announced that their EA Sports titles won’t be coming to Wii U and that they don’t have any games in development for the system. 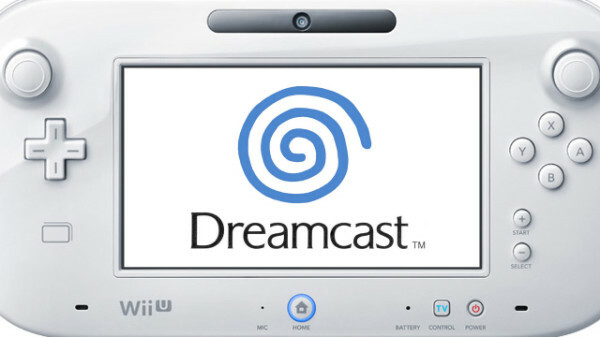 Does this remind anyone of the Dreamcast situation? “Nintendo are still operating like it’s 1990.They should have “done a Sega” and offered Mario/Zelda as PS4/Durango exclusives. If that wasn’t enough, EA’s Bob Summerwill Senior SE and Architect of EA Sports, has decided to take to twitter to insult the console by stating that it’s a crap console and that Nintendo should have just went 3rd party (like SEGA did). But it seems that EA probably told him to stop what he was doing, since he has deleted the tweets. But of course, the internet caught on fast. Hit the jump for more wonderful quotes.